We present 3 basic steps that lead from acceptance of the premises from developer to a beautifully designed and perfectly finished apartment/ house. With regard to your comfort and finances perfect Space has prepared two types of projects, which will lead you to a finished apartment. It is a floor plan of the  whole apartment, which  includes colored characte ristics of individual mate rials and products from our  offer and functional layout  of all rooms. 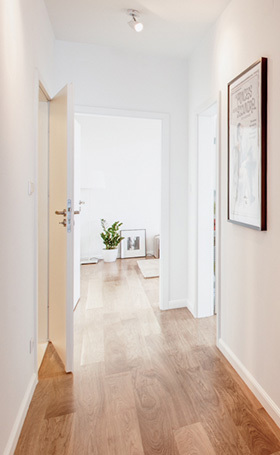 This offer is  designed for all Clients  who just need to design  their apartment within the existing wall layout and don’t want to change it (works like: moving partition walls, complete rearrangement of rooms, electrical installations or plumbing etc. are not needed). Every TWINSEN is made after thorough discussion with the Client (and according to PS questionnaire) and its property condition survey. There are three changes available in functional layout within TWINSEN project. The price of color Twinsen, including the essential carpentry projects, list of all finishing materials, comprehensive cost estimate of all works and full work supervision, is: PLN 49/ sq.m. (gross). Note: You can expand this project by ordering computer rendering of individual rooms, like bathroom, living room or kitchen. The cost of two computer renderings of a given room is only PLN 999 gross! The standard period is 14 days from the date ofrecording the 100% amount paid. This option is designed for all Clients who need a fully individual approach, tailored exactly to their needs or for those who think that Twinsen project may be too small for them. list of all doors and carpentry, etc. 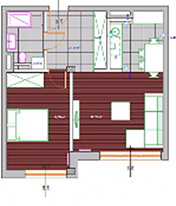 The price of full project is PLN 149/ sq.m. gross. Odebranie mieszkania tylko z pozoru wydaje się czystą przyjemnością. Okazuje się jednak, że na zwykłego klienta czeka bardzo dużo pułapek. Nasze działania są pomocne w wykrywaniu wszelkiego rodzaju usterek, które deweloper musi bezpłatnie usunąć. Warto pamiętać, że drobne usterki często bardzo przeszkadzają w odpowiednim wykończeniu mieszkania, a czasem wręcz uniemożliwiają zrealizować ów proces zgodnie z oczekiwaniami klienta. Nasi pracownicy są tutaj, żeby pomóc Państwu i w tym zakresie.